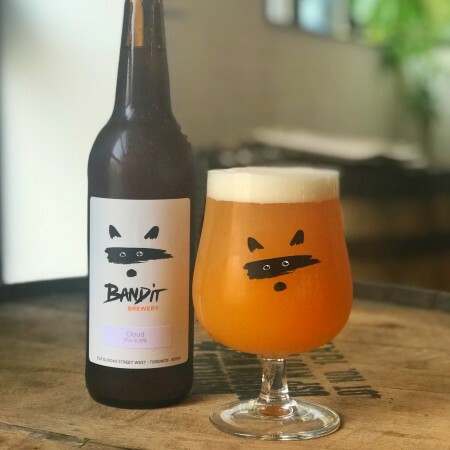 TORONTO, ON – Bandit Brewery has announced the release of a new “hazy, extra-juicy and intensely aromatic” IPA. For this new IPA we made some slight modifications in the malt bill, adding a huge amount of oats to provide extra haziness and a creamy mouthfeel. CLOUD was double dry-hopped using Galaxy, Citra, Summer, and El Dorado, resulting in a beer bursting with aromas of mango, stone fruit, and a subtle hint of citrus. A hint of lingering bitterness balances out some of the sweet “fruitiness” of the beer, keeping you wanting just another sip. CLOUD IPA is now available on tap in the Bandit brewpub and in bottles in the retail shop.